For the motorcycle racer, see José David de Gea. 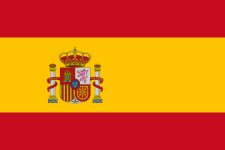 This name uses Spanish naming customs: the first or paternal family name is De Gea and the second or maternal family name is Quintana. * Senior club appearances and goals counted for the domestic league only and correct as of 27 November 2016. ‡ National team caps and goals correct as of 13 November 2016. David de Gea Quintana (Spanish pronunciation: [daˈβið ðe ˈxea kinˈtana]; born 7 November 1990) is a Spanish professional footballer who plays as a goalkeeper for English club Manchester United and the Spain national team. He has been hailed as one of the best goalkeepers in the world. Born in Madrid, De Gea began his career aged 13 with Atlético Madrid and rose through the academy system at the club before making his senior debut in 2009. After being made Atlético's first-choice goalkeeper, he helped the team win both the UEFA Europa League and the UEFA Super Cup in 2010. His performances attracted the attention of Manchester United, whom he joined in June 2011 for £17.8 million, a British record for a goalkeeper. De Gea was the captain for the Spain under-21 national side that won the European Championship in 2011 and 2013, and also competed in the 2012 Olympics. He made his debut for the senior team in 2014 and was selected for that year's World Cup, and has been tipped by many as the successor to Iker Casillas as Spain's long-term goalkeeper. Born in Madrid and raised in Illescas, De Gea joined Atlético Madrid at the age of 13 when his then-coach Juan Luis Martín lied to the club that Rayo Vallecano were set to sign him. A few days later, Diego Díaz Garrido scouted De Gea and signed him immediately. He eventually made his way up through the youth ranks at the club before signing his first professional contract in 2008, aged 17, contracting him to Atlético until 2011. He spent his second season for Atlético Madrid B in Segunda División B. In the summer of 2009, De Gea was approached by Numancia and English team Queens Park Rangers with regards to a loan move, with Atlético sporting director Jesús García Pitarch pushing for him to move to Numancia. De Gea rejected the approach, and was punished by being forced to train by himself. Weeks later, Atlético manager Abel Resino noticed De Gea training alone and invited him to train with the first team, where he was rated as the third-choice goalkeeper. The same summer, Atlético rejected an offer from English team Wigan Athletic for a permanent transfer for De Gea. With first-choice goalkeeper Sergio Asenjo away on international duty at the 2009 FIFA U-20 World Cup, De Gea was called up to the senior side as cover for Roberto. He made his debut for the Atlético first-team at the age of 18 on 30 September 2009, coming on as a substitute after Roberto was injured after 27 minutes of Atlético's UEFA Champions League Group Stage match away to Porto; De Gea conceded two late goals as Atlético lost 2–0. Roberto's injury meant that De Gea was given his La Liga debut three days later, at home to Real Zaragoza; he gave away a penalty kick in the 19th minute, but immediately redeemed himself by saving Marko Babić's attempt in an eventual 2–1 win. He described starting at the Vicente Calderón Stadium as a "dream since childhood". In January 2010, De Gea was touted as a possible replacement for Manchester United goalkeeper Edwin van der Sar, who was set to retire in 2011. Days later, however, he signed a new contract which would keep him with Atlético until 2013. After some costly mistakes by Asenjo, and the arrival of Quique Sánchez Flores as manager, De Gea finished the 2009–10 season as the starting "number one". He won two man of the match awards along the way, against Athletic Bilbao and Valencia. Additionally, he appeared in eight games in the club's victorious UEFA Europa League campaign, including the 2–1 final win against Fulham. Diego Forlán later said of his first season, "David was good enough for the top level at 19 and the players had confidence in him." This boy is as cold as a wolf. He has composure, nerve and self-confidence. The pressures that others might feel don't affect him. — Atlético youth goalkeeping coach Ángel Mejías in 2010. De Gea started 2010–11 in impressive fashion, helping Atlético win the season's UEFA Super Cup. In the 90th minute of the 2–0 win against Internazionale, he saved a Diego Milito penalty kick. In September, it was reported that Manchester United manager Sir Alex Ferguson had missed a League Cup game with Scunthorpe United to travel to Spain to watch De Gea in action against Valencia. De Gea played down the rumours, saying, "The important thing is that I have a contract here and I'm an Atletico player until 2013." Even though he's still growing physically and mentally, he's already on the road to becoming one of the best keepers around. Any other outcome would be a disappointment. — Atlético goalkeeping coach Diego Díaz Garrido in 2010. Throughout the 2010–11 season, speculation regarding how Manchester United would replace their retiring goalkeeper Edwin van der Sar was widespread, and much attention focused on De Gea as United's key target. 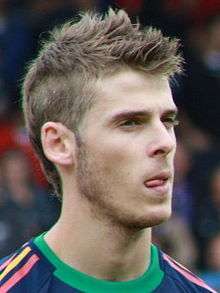 After Gary Neville's testimonial against Juventus on 24 May, United manager Sir Alex Ferguson claimed that a deal had been done to bring De Gea to Old Trafford, but this was later denied by the player's representatives and the Atlético management, with De Gea stating that he would not consider his future until after the UEFA Under-21 Championship. Following Spain's victory in the tournament, De Gea was spotted in Manchester undergoing a medical with United on 27 June. The next day, he reported that United were making him a contract offer, and the transfer was confirmed on 29 June for a British record fee for a goalkeeper of approximately £17.8 million. Growing up, De Gea had admired United goalkeeper Peter Schmeichel, and was often compared to Van der Sar, furthered by being dubbed "Van der Gea". De Gea is high, has good feet, comes with authority and is agile... has everything to be one of the greatest goalkeepers in the next ten years. — Edwin van der Sar, former Manchester United goalkeeper. De Gea made his first appearance for Manchester United in a 3–1 friendly win over Chicago Fire on 23 July 2011. He made his competitive debut for United against Manchester City in the Community Shield on 7 August. Despite being caught out in the first-half by a header from Joleon Lescott and a long-range Edin Džeko strike that put City into a 2–0 lead, United rallied in the second half and won 3–2. De Gea made his league debut for Manchester United against West Bromwich Albion a week later, where he received criticism for failing to save Shane Long's goal during a 2–1 United victory, which Ferguson described as "a learning process". De Gea kept his first clean sheet for United on his Old Trafford debut in the following fixture, a 3–0 victory against Tottenham Hotspur. In the following game, six days later, De Gea saved a penalty from Arsenal captain Robin van Persie, which would have cancelled out United's 1–0 lead. He made further saves to deny Van Persie and Andrey Arshavin in United's 8–2 victory. Teammate Wayne Rooney backed De Gea to succeed at United and hailed him as a "strong character". On 18 September, Manchester United beat Chelsea 3–1 at Old Trafford, with De Gea making a string of impressive saves, particularly from Ramires — when the midfielder had an empty net to side-foot home, De Gea quickly got across to smother the ball away. De Gea's improvement in form continued in his next game, as he made two stunning saves to help his side to a 1–1 draw away at Stoke City, and his overall performance was praised by teammates Patrice Evra and Darren Fletcher. De Gea made his first ever UEFA Champions League start in a 3–3 draw against Basel on 27 September 2011. On 15 October, De Gea was praised for his efforts at Anfield as United drew 1–1 against Liverpool, providing important saves in a nerve-free performance, prompting Liverpool manager Kenny Dalglish to joke, "I thought the press said the boy was struggling." On 23 October 2011, De Gea played as Manchester United suffered their worst home defeat since 1955 with a 6–1 loss against cross-town rivals Manchester City, the first time United had conceded six goals at home since 1930. De Gea was in goal during the league defeat to Blackburn Rovers and was blamed by most media outlets for failing to deal with an aerial ball that led to the conceding of a late goal by Grant Hanley in a 3–2 defeat. De Gea was nonplussed by the error, saying, "all keepers make mistakes once in a while and none of us like it when we do. I have every intention of spending many years here at Manchester United. I want to become a great United keeper and I want to earn and deserve the respect I hope to get," and spoke of his intentions of surpassing his predecessor: "Hopefully, I will equal or even surpass the performance and contribution Edwin van der Sar made to the club." After this game, De Gea was dropped and replaced by United's second-choice goalkeeper, Anders Lindegaard. An injury to Lindegaard saw De Gea return to the starting line-up for a 3–3 draw with Chelsea at Stamford Bridge on 5 February 2012. De Gea later cited his last-minute save from Juan Mata during this match as the turning point in his season, as he went on to play the club's last 19 matches, keeping eight clean sheets. After a difficult first season in England, De Gea said, "There have been doubts in the first season but I always had faith in my ability. The pressure at an elite club like United is huge but Ferguson just told me to do what I did at Atlético. You have to be as strong when things go wrong but I don't get nervous. Mistakes are normal; everyone makes them." His goalkeeping rival Lindegaard, however, promised to fight for the place he lost via injury, saying, "I want the number one spot because I am the best. I am sure he is a bit in front right now because he did well last season, so I need to take every chance I get to prove myself worthy of the number one spot." De Gea later admitted that he thought about leaving after the first season. Due to his involvement in the 2012 Olympics, De Gea missed Manchester United's pre-season tour, but nevertheless returned to the starting line-up for the opening game of the season against Everton. Despite some "outstanding" saves from De Gea, United lost 1–0. In the next game, a 3–2 win at home to Fulham, he made some noteworthy saves from Mladen Petrić, Moussa Dembélé and Bryan Ruiz. In attempting to claim a cross from Matthew Briggs, however, a misunderstanding with Nemanja Vidić led to the Serbian defender putting the ball in his own net for Fulham's second goal. I've no doubts that David De Gea can be a top goalkeeper, one of the best in the world. He's physically going to mature in the next 18 months and he needs a championship. — Gary Neville in 2013. On 9 December, De Gea made back-to-back saves from Manchester City's Carlos Tevez and David Silva, helping United to a 3–2 Manchester Derby win at the City of Manchester Stadium. In the next match, a 3–1 win against Sunderland at Old Trafford, De Gea produced an important double-save from Craig Gardner and Stéphane Sessègnon's follow-up. De Gea received criticism from former United captain Gary Neville for a punch that allowed Tottenham to score a stoppage time equaliser in a 1–1 draw at White Hart Lane on 20 January 2013, saying, "You've got to learn the hard way and he's learning in a very unforgiving environment where he's judged continuously at the highest level. There's a theory that he saved Manchester United because he made two or three great saves, but unfortunately that's a waste of time. He played well yesterday, but playing well for 92-and-a-half minutes and then doing that in the 93rd is a problem at a club like that." Ferguson responded by saying De Gea's critics were "idiots." On 13 February 2013, De Gea made several saves to help United to a 1–1 draw against Real Madrid at the Santiago Bernabéu Stadium in the first leg of the last 16 of the Champions League, and was praised by manager Sir Alex Ferguson for his "excellent" performance, one which was said to have turned him from "villain to hero" and made him "come of age". You bring a boy into the Premier League at 20, it's not easy. He's learning in the toughest environment in the world. But the one thing he has is fantastic inner strength. We teach him that the calmest man on the field has to be the goalkeeper. And one of his great strengths is his calmness. — goalkeeping coach Eric Steele in 2013. On 23 February, De Gea recorded his second consecutive clean sheet for United, stopping a Loïc Rémy shot and a Christopher Samba header to help United to 2–0 victory over Queens Park Rangers. This was followed by a 4–0 win at Old Trafford against Norwich City on 2 March. Another clean sheet came on 16 March in a 1–0 victory against Reading. De Gea was on the receiving end of a controversial aerial challenge by West Ham United striker Andy Carroll that left him "poleaxed", with Ferguson expressing his disbelief at the lack of a red card. De Gea's form throughout the season was recognised by his peers, culminating in being voted into the PFA Premier League Team of the Year. He ended the season with his first Premier League winner's medal with United, making 28 appearances and keeping 11 clean sheets, as the team topped the Premier League table by 11 points. This placed him joint-fifth in the race for the Premier League Golden Glove. He has huge faith in himself, which is a really important virtue. He doesn't let anything affect him. The day he makes a mistake he knows he has made a mistake but it never sinks him. He uses it to make sure that he doesn't make the mistake next time. It's a great quality. — Juan Mata in 2014. 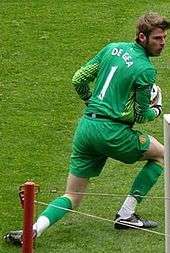 De Gea's season began with a clean sheet in the 2–0 win over Wigan in the Community Shield at Wembley Stadium. On 5 October 2013, De Gea's save to deny Sunderland's Emanuele Giaccherini during a 2–1 away win was described by former Manchester United goalkeeper Peter Schmeichel as one of the best saves ever seen in the Premier League. Manager David Moyes agreed with Schmeichel's assessment, describing the save was a "turning point" in a game in which they were losing 1–0 at the time, and said De Gea "is improving all the time". On 1 December, De Gea made his 100th appearance for Manchester United in a 2–2 draw against Tottenham. He received the backing of teammate Darren Fletcher, when, in the League Cup semi-final second leg against Sunderland on 22 January 2014, De Gea was deemed to be at fault when he let a weak Phil Bardsley shot past him deep into extra time; a Javier Hernández goal soon after left the aggregate score at 3–3, resulting in a penalty shoot-out, where De Gea's penalty saves from Steven Fletcher and Adam Johnson were not enough to help United advance, losing 2–1. On 19 March, whilst playing against Olympiacos in the first knockout stage of the Champions League as United came from 2–0 down to win 3–2 on aggregate, De Gea made a crucial double-save before half-time which was said to have defied "all known laws of physics and physiology" in a performance described as "magnificent". Teammate Phil Jones claimed that "he's up there with the best goalkeepers in the world". De Gea's performances throughout the season saw him named as both the club's Players' Player of the Year and Fans' Player of the Year. — Gary Neville in 2014. De Gea helped United secure back-to-back victories for the first time under their new manager Louis van Gaal in a home victory against Everton on 5 October 2014. During the match, De Gea made three important saves, including one penalty from Leighton Baines, to help United secure a 2–1 win in which he was voted by Manchester United fans as man of the match. He became the first goalkeeper to stop a penalty from Baines, who had previously converted all of his 14 Premier League penalties. After several vital stops against Everton, West Brom and Chelsea, he was named Manchester United's Player of the Month for October. On 14 December, De Gea was awarded the man of the match for his "outstanding" performance against Liverpool, making eight saves in a 3–0 victory, a performance rated as the best of the Premier League season. He was hailed by Van Gaal as "unbelievable" for his performances, and was called the "saving grace" for being the one constant in the team throughout the season. Amid rumours of a departure, he said he was "proud" to play for United, and was prompted by Peter Schmeichel and Gary Neville to sign a new contract with the club. At the end of the season, De Gea was shortlisted for the PFA Players' Player of the Year and the PFA Young Player of the Year, before losing out to Eden Hazard and Harry Kane respectively. On 26 April 2015, De Gea was named in the PFA Team of the Year as its goalkeeper and its only Manchester United player. He also won both Fans' Player of the Year and Players' Player of the Year awards for the second consecutive season. His save against Everton was voted as Premier League Save of the Season by Match of the Day, the second consecutive year he won the award. On 7 August 2015, Manchester United manager Louis van Gaal confirmed that De Gea would not be considered for selection for United's Premier League opener against Tottenham the following day, due to the uncertainty surrounding his future. On 13 August, Van Gaal revealed that De Gea had requested to goalkeeping coach Frans Hoek that he be left out of the side. De Gea claimed he never expressed a desire not to play, but trained with the reserves soon after. On 31 August, after a summer of speculation, an agreement for a transfer was reached between Manchester United and Real Madrid worth £29 million, including the part-exchange of fellow goalkeeper Keylor Navas. The deal, however, collapsed due to paperwork not being submitted before the transfer window in Spain closed. After the transfer window closed, Spanish head coach Vicente del Bosque admitted that it would be difficult for him to select De Gea in Spain's European Championship squad if Manchester United continued not to select him. On 11 September, De Gea signed a new four-year deal with Manchester United, with an option to extend it for a further year. Twelve days later, in the third round of the League Cup, De Gea captained Manchester United for the first time, wearing the armband for the final nine minutes of their win over Ipswich Town. In April 2016, while leading the race for the Golden Glove with 14 clean sheets, De Gea was the sole Manchester United player named in the PFA Team of the Year. On 23 April, in a 2–1 win over Everton in the FA Cup semi-finals, he saved a penalty from Romelu Lukaku. In May 2016, De Gea became the first player ever to win Manchester United's Player of the Year for a third consecutive season. During the same month, he also won BBC Match of the Day Save of the Season for the third consecutive year, for his save against Watford on 21 November 2015. In the last league game of the season, a 3–1 win over AFC Bournemouth, De Gea was denied the chance to share the Premier League Golden Glove with Arsenal's Petr Čech due to a stoppage-time own goal by Chris Smalling. Under new manager, Jose Mourinho, De Gea made his first appearance of the season in FA Community Shield against FA Cup winners, Leicester City, the match ended in a 2–1 victory for the FA Cup winner. De Gea helped Spain's under-17 team win the 2007 European Championship, and finish second at the 2007 World Cup. In early May 2010, courtesy of solid Atlético performances, he was named by senior squad manager Vicente del Bosque in a provisional 30-man squad for the 2010 FIFA World Cup; however, he did not make the final cut. In 2011, he was part of the Spain under-21 team that won the 2011 European Championship. On 15 May 2012, De Gea was called up for to the Spanish senior side for two matches against Serbia and PR China. He was in consideration for Del Bosque's Euro 2012 squad, but did not make the final 23-man group. He was selected, however, to play at the London 2012 Olympics, and played all three matches as the nation was eliminated in the group stage. De Gea and Spain under-21 retained their European title in 2013. On 13 May 2014, De Gea was selected in Spain's 30-man provisional squad for the 2014 World Cup, and later made the final squad. He made his first senior international appearance against El Salvador in a 2–0 friendly victory on 8 June in preparation for the tournament, replacing Iker Casillas for the last seven minutes of the game at the FedEx Field in Washington, D.C. As third-choice goalkeeper behind Casillas and Pepe Reina, De Gea was the only member of the squad not to feature at that World Cup, in which Spain were eliminated in the group stage. On 4 September 2014, he made his first start for Spain, playing the whole 90 minutes against France in a Paris friendly and conceding a goal from Loïc Rémy to lose 1–0. He played his first competitive international on his third cap on 12 October, keeping a clean sheet in a 4–0 win away to Luxembourg in UEFA Euro 2016 qualifying. He has been tipped by many to succeed Casillas as the long-term number one goalkeeper, including Casillas himself. On 31 May 2016, he was named to Vicente del Bosque's final 23-man Spanish squad for UEFA Euro 2016. He started their opening game against the Czech Republic in Toulouse, keeping a clean sheet in a 1–0 victory. He followed up with another clean sheet against Turkey as Spain won 3–0. The following match, however, he conceded twice to Croatia as his team lost 2–1. Spain was eliminated in the round of 16, with their opponent Italy scoring the only two goals of the match. In January 2012, De Gea was confirmed as farsighted, although this is not thought to have affected his performances. Since 2010, he has been in a relationship with Spanish singer and TV presenter Edurne. ↑ "Player Profile: David de Gea". Premier League. Retrieved 9 July 2013. ↑ Ogden, Mark (15 December 2014). "Wayne Rooney: Man Utd can win title with 'best in world' David de Gea". The Telegraph. Retrieved 15 December 2014. ↑ "David de Gea's performance sparks 'best goalkeeper in the world' debate". The Telegraph. 15 December 2014. Retrieved 15 December 2014. ↑ "Player of the Year Awards 2015 16". ManUtd.com. 3 May 2016. Retrieved 3 May 2016. 1 2 Jenson, Pete (15 October 2014). "David De Gea has finally come of age and looks the future for both Spain and Manchester United". The Independent. Retrieved 15 December 2014. 1 2 Hidalgo, Dani (5 October 2009). "Un Illescas orgulloso se volcó con De Gea" [A proud Illescas turned to De Gea]. AS (in Spanish). Retrieved 19 December 2014. ↑ Casáñez, Juan (9 October 2009). "Mentí al Atlético para que fichara a De Gea" [I lied to bring Atletico De Gea]. AS (in Spanish). Retrieved 16 December 2014. ↑ "De Gea firma contrato profesional con el Atlético hasta 2011" [De Gea signs professional contract with Atletico until 2011]. AS (in Spanish). 11 March 2008. Retrieved 16 December 2014. 1 2 3 Mitten, Andy (15 December 2014). "In-form David De Gea embodies Man United's upturn in fortunes". ESPN. Retrieved 15 December 2014. ↑ "De Gea rechazó una oferta del Wigan" [De Gea rejected an offer from Wigan]. Marca (in Spanish). 1 September 2009. Retrieved 16 December 2014. 1 2 Bryan, Paul (5 October 2009). "De Gea stands tall after whirlwind bow". UEFA.com. Union of European Football Associations. Retrieved 1 July 2011. ↑ "De Gea: "Empezar aquí parando un penalti ha sido un sueño"" [De Gea: "Starting here by stopping a penalty has been a dream"]. Marca (in Spanish). 14 October 2009. Retrieved 16 December 2014. ↑ "De Gea: "Debutar en el Calderón es mi sueño desde pequeño"" [De Gea: "Start at the Calderon is my dream since childhood"]. Marca (in Spanish). 1 October 2009. Retrieved 15 December 2014. ↑ "La prensa inglesa sitúa a De Gea en el radar del Manchester United" [The British press puts De Gea on the radar of Manchester United]. Marca (in Spanish). 24 January 2010. Retrieved 16 December 2014. ↑ Molina, Francisco (28 January 2010). "De Gea, hasta 2013 de rojiblanco" [De Gea, Atletico until 2013]. Marca (in Spanish). Retrieved 16 December 2014. 1 2 3 4 "De Gea factfile". Sky Sports. BSkyB. 27 June 2011. Retrieved 27 June 2011. ↑ "Atletico Madrid 2 – 1 Fulham". BBC Sport. British Broadcasting Corporation. 12 May 2010. Retrieved 13 May 2010. 1 2 Bryan, Paul (14 May 2014). "Atlético trust in youthful De Gea". Retrieved 17 May 2014. ↑ "Slick Atlético seal Super Cup success". UEFA.com. Union of European Football Associations. 27 August 2010. Retrieved 28 August 2010. ↑ "United linked with De Gea after Fergie misses cup clash". ESPN. 23 September 2010. Retrieved 15 December 2014. ↑ "Ferguson espió a De Gea" [Ferguson spied on De Gea]. Marca (in Spanish). 23 September 2010. Retrieved 15 December 2014. ↑ "De Gea not thinking about Manchester United move". ESPN. 28 September 2010. Retrieved 15 December 2014. ↑ Train, Rob (11 November 2010). "Spain is in very good hands". ESPN. Retrieved 15 December 2014. ↑ Del Estal, Sandra (5 November 2010). "Casillas: "De Gea peleará pronto por mi puesto"" [Casillas: "De Gea will fight soon in my position"]. AS (in Spanish). Retrieved 15 December 2014. ↑ Ducker, James (17 November 2010). "Manchester United eye David De Gea to succeed Edwin van der Sar". The Times. Retrieved 8 July 2015. (subscription required (help)). ↑ "Manchester United close to signing keeper - David Gill". BBC Sport. British Broadcasting Corporation. 16 May 2011. Retrieved 29 June 2011. ↑ "De Gea denies Manchester United deal is imminent". BBC Sport. British Broadcasting Corporation. 26 May 2011. Retrieved 29 June 2011. ↑ Herbert, Ian (28 June 2011). "£17.8m keeper De Gea set for United after medical". independent.co.uk. London: Independent Print. Retrieved 15 November 2011. ↑ "Manchester United confirm signing of David de Gea". BBC Sport. British Broadcasting Corporation. 29 June 2011. Retrieved 29 June 2011. ↑ Hunter, Graham (23 March 2011). "Is he the one? Why David De Gea could be Manchester United's next goalkeeper". ESPN. Retrieved 19 December 2014. ↑ Estepa, Javier (26 May 2011). "De Van der Sar a 'Van der Gea'" [Van der Sar to 'Van der Gea']. Marca (in Spanish). Retrieved 19 December 2014. ↑ Balague, Guillem (2 October 2010). "Van Der Sar: "De Gea tiene un aire a mí cuando yo era joven"" [Van Der Sar: "De Gea has an air to me when I was young"]. AS (in Spanish). Retrieved 15 December 2014. ↑ Ogden, Mark (24 July 2011). "Manchester United goalkeeper David de Gea shines on debut in 3-1 victory over Chicago Fire on US Tour". The Telegraph. Retrieved 15 December 2014. ↑ Bevan, Chris (7 August 2011). "Man City 2-3 Man Utd". BBC Sport. British Broadcasting Corporation. Retrieved 7 August 2011. ↑ Chowdhury, Saj (14 August 2011). "West Brom 1-2 Man Utd". BBC Sport. British Broadcasting Corporation. Retrieved 14 August 2011. ↑ Taylor, Daniel (14 August 2011). "Nervous start has put David De Gea's Manchester United place in doubt". The Guardian. Retrieved 15 December 2014. ↑ Winter, Henry (22 August 2011). "Manchester United 3 Tottenham Hotspur 0: match report". The Telegraph. Retrieved 15 December 2014. ↑ McNulty, Phil (28 August 2011). "Man Utd 8-2 Arsenal". BBC Sport. British Broadcasting Corporation. Retrieved 29 August 2011. ↑ "Wayne Rooney backs David de Gea to succeed at Manchester United". The Guardian. 31 August 2011. Retrieved 15 December 2014. ↑ Da Silva, Michael (24 August 2011). "Stoke 1-1 Man Utd". BBC Sport. British Broadcasting Corporation. Retrieved 25 August 2011. ↑ Mathieson, Stuart (26 September 2011). "Manchester United star David de Gea's homework pays off". Manchester Evening News. Retrieved 16 December 2014. ↑ Winter, Henry (15 October 2011). "Manchester United goalkeeper David de Gea passes the test of nerve at Liverpool's Kop End". The Telegraph. Retrieved 16 December 2014. ↑ Jolly, Richard (15 October 2011). "Ferguson shuffles his pack at Anfield". ESPN. Retrieved 16 December 2014. ↑ McNulty, Phil (23 October 2011). "Man Utd 1-6 Man City". BBC Sport. British Broadcasting Corporation. Retrieved 5 November 2011. ↑ Hayward, Paul (23 October 2011). "Regal Manchester City destroy United to threaten the old order". The Guardian. Retrieved 16 December 2014. ↑ Stone, Simon (1 January 2012). "De Gea gift-wraps points for Blackburn". Irish Independent. Retrieved 16 December 2014. ↑ Stone, Simon (3 January 2012). "Manchester United goalkeeper David de Gea relaxed about mistakes". The Independent. Retrieved 16 December 2014. ↑ "I can surpass Van der Sar - De Gea". ESPN. 3 January 2012. Retrieved 16 December 2014. ↑ Wallace, Sam (6 January 2012). "Manchester United are dogged by too many problems". The Independent. Retrieved 16 December 2014. ↑ Williams, Richard (5 February 2012). "Manchester United's David de Gea shows true worth in Spanish duel". The Guardian. Retrieved 16 December 2014. ↑ Mathieson, Stuart (7 February 2013). "De Gea's future is still in his hands". Manchester Evening News. Retrieved 9 May 2014. ↑ "Man Utd's De Gea: 'I always had faith in my ability'". ESPN. 23 July 2012. Retrieved 15 December 2014. ↑ Stone, Simon (20 July 2012). "Anders Lindegaard plans to usurp David de Gea as Manchester United number one". The Independent. Retrieved 15 December 2014. ↑ Hirst, Paul (7 October 2014). "David de Gea considered leaving United after 'difficult' start to life at Old Trafford". The Independent. Retrieved 16 December 2014. ↑ McNulty, Phil (20 August 2012). "Everton 1-0 Man Utd". BBC Sport. British Broadcasting Corporation. Retrieved 29 August 2012. ↑ Magowan, Alistair (25 August 2012). "Man Utd 3-2 Fulham". BBC Sport. British Broadcasting Corporation. Retrieved 29 August 2012. 1 2 "Gary Neville says Manchester United players will demand more of David De Gea after Tottenham error". Sky Sports. 22 January 2013. Retrieved 15 December 2014. ↑ McCauley, Kevin (9 December 2012). "Manchester City vs. Manchester United: Final score 3-2, Robin van Persie wins match marred by crowd trouble". sbnation. SBNATION. Retrieved 14 December 2012. ↑ Mathieson, Stuart (15 December 2012). "Manchester United 3 Sunderland 1: Premier League match report". MENmedia. Manchester Evening News. Retrieved 16 December 2012. ↑ Jackson, Jamie (26 January 2013). "Manchester United's Alex Ferguson calls David de Gea's critics 'idiots'". The Guardian. Retrieved 9 May 2014. ↑ McNulty, Phil (13 February 2013). "Sir Alex Ferguson praises David de Gea". bbc.co.uk. BBC Sport. Retrieved 14 February 2013. ↑ Ogden, Mark (14 February 2013). "Manchester United goalkeeper David De Gea transported from villain to hero in 90 minutes in Madrid". The Telegraph. Retrieved 20 December 2014. ↑ Herbert, Ian (14 February 2013). "Did Manchester United goalkeeper David de Gea come of age against Real Madrid?". The Independent. Retrieved 20 December 2014. ↑ Taylor, Daniel (14 February 2013). "David de Gea looking the part in Manchester United's glove department". The Guardian. Retrieved 15 December 2014. ↑ Magowan, Alistair (23 February 2013). "QPR 0-2 Manchester United". bbc.co.uk. BBC Sport. Retrieved 7 May 2013. ↑ Ornstein, David (2 March 2013). "Manchester United 4-0 Norwich". bbc.co.uk. BBC Sport. Retrieved 7 May 2013. ↑ Magowan, Alistair (16 March 2013). "Manchester United 1-0 Reading". bbc.co.uk. BBC Sport. Retrieved 7 May 2013. ↑ Hytner, David (18 April 2013). "Manchester United bemoan lack of red card for Andy Carroll of West Ham". The Guardian. Retrieved 15 December 2014. ↑ "Manchester United dominate PFA team of the year". Sky Sports. 28 April 2013. Retrieved 15 December 2014. ↑ Lowe, Sid (14 May 2014). "Man Utd's Juan Mata: David de Gea is so calm he is 'almost unconscious'". The Guardian. Retrieved 15 December 2014. ↑ Rostance, Tom (11 August 2013). "Man Utd 2-0 Wigan". BBC. Retrieved 26 June 2014. ↑ Oscroft, Tim (5 October 2013). "Schmeichel lauds De Gea save". Manchester United F.C. Official Website. Retrieved 6 October 2013. ↑ Murray, Ewan (6 October 2013). "David de Gea's saves give Manchester United a platform at Sunderland". The Guardian. Retrieved 15 December 2014. ↑ Bailey, Graeme (7 October 2013). "David Moyes hails form of Manchester United goalkeeper David De Gea". Sky Sports. Retrieved 15 December 2014. ↑ Anderson, David (13 November 2013). "Manchester United's David De Gea looking for more as he closes in on his 100th appearance". Daily Mirror. Retrieved 15 December 2014. ↑ "Darren Fletcher backs David de Gea following semi-final mistake". The Guardian. 23 January 2014. Retrieved 20 December 2014. ↑ "Manchester United's Darren Fletcher backs goalkeeper David de Gea". Sky Sports. 23 January 2014. Retrieved 20 December 2014. ↑ De Menezes, Jack (23 January 2014). "The worst penalty shoot-out ever? Penalty-by-penalty analysis of Sunderland's Capital One Cup victory over Manchester United". The Independent. Retrieved 20 December 2014. ↑ White, Jim (20 March 2014). "Manchester United goalkeeper David De Gea stands tall as his side progress to Champions League quarter-finals". The Telegraph. Retrieved 19 December 2014. ↑ Thompson, Gemma (20 March 2014). "De Gea is world class". Manchester United F.C. Official Website. Retrieved 19 December 2014. ↑ Richards, Chris (8 May 2014). "David de Gea named Manchester United Player of the Year AND Players' Player of the Year". Daily Mirror. Retrieved 9 May 2014. ↑ Neville, Gary (16 December 2014). "Manchester United's David de Gea 'has now become a great goalkeeper', says Gary Neville". Sky Sports. Retrieved 16 December 2014. ↑ Grant, Ryan (5 October 2014). "David De Gea named Man of the Match". Manchester United F.C. Official Website. Retrieved 15 December 2014. ↑ "Manchester United vs Everton: Leighton Baines misses first penalty of his Premier League career". The Independent. 5 October 2014. Retrieved 20 December 2014. ↑ Froggatt, M; Tuck, J (31 October 2014). "De Gea is October Player of the Month". Manchester United F.C. Official Website. Retrieved 1 December 2014. ↑ Wallace, Sam (14 December 2014). "David De Gea outstanding as clinical United make Liverpool suffer". The Independent. Retrieved 15 December 2014. ↑ "Which is the only game De Gea's made more Premier League saves in?". FourFourTwo. 14 December 2014. Retrieved 20 December 2014. ↑ Syed, Matthew (15 December 2014). "David de Gea's wizardry stops opponents and admirers in tracks". The Times. Retrieved 15 December 2014. (subscription required (help)). ↑ "David de Gea is an unbelievable goalkeeper, says Louis van Gaal". Sky Sports. 5 March 2015. Retrieved 13 April 2015. ↑ Wilson, Paul (14 March 2015). "David de Gea is saving grace of Manchester United's confusing season". The Guardian. Retrieved 13 April 2015. ↑ "David De Gea deal would send a signal - Man Utd legend Peter Schmeichel". ESPN. 24 February 2015. Retrieved 13 April 2015. ↑ Orr, James (13 April 2015). "David De Gea says he is 'proud to be a red' as Gary Neville warns Manchester United must keep the goalkeeper at all costs". The Independent. Retrieved 13 April 2015. ↑ Luckhurst, Samuel (16 April 2015). "Manchester United goalkeeper De Gea nominated for PFA Player of the Year award". Manchester Evening News. Retrieved 16 April 2015. ↑ "PFA awards: Kane, Hazard, De Gea, Coutinho on both shortlists". BBC. 16 April 2015. Retrieved 16 April 2015. ↑ "Chelsea's Eden Hazard named PFA Player of the Year". BBC Sport. BBC Sport. BBC Sport. 26 April 2015. Retrieved 27 April 2015. ↑ "PFA Team of the Year: Chelsea have six players selected". BBC Sport (British Broadcasting Corporation). 26 April 2015. Retrieved 26 April 2015. ↑ Froggatt, Mark (19 May 2015). "De Gea is Sir Matt Busby Player of the Year". ManUtd.com. Manchester United. Retrieved 20 May 2015. ↑ Froggatt, Mark (19 May 2015). "David De Gea wins Players' Player of the Year prize". ManUtd.com. Manchester United. Retrieved 20 May 2015. ↑ "What was your Premier League save of the season?". BBC Sport (British Broadcasting Corporation). 17 May 2015. Retrieved 20 May 2015. ↑ "Man Utd: David De Gea not the same as last season - Van Gaal". BBC Sport. British Broadcasting Corporation. 7 August 2015. Retrieved 8 August 2015. ↑ Jolly, Richard (13 August 2015). "Louis van Gaal says David De Gea agreed to be left out against Spurs". ESPN FC. Retrieved 14 August 2015. ↑ Roan, Dan (14 August 2015). "Man Utd: David De Gea is surprised at being left out". BBC Sport. Retrieved 14 August 2015. ↑ "David De Gea: Man Utd deny blame for failed Real Madrid deal". BBC Sport. 1 September 2015. ↑ "Vicente del Bosque warns David de Gea over Euro 2016 spot". Sky Sports. 2 September 2015. Retrieved 11 September 2015. ↑ "De Gea signs new United contract". Manchester United. 11 September 2015. ↑ Jolly, Richard (24 September 2015). "David De Gea 'proud' to captain Man United after Real Madrid transfer saga". ESPN FC. Retrieved 13 January 2016. ↑ "PFA awards: Leicester and Spurs dominate Premier League team". BBC Sport. 21 April 2016. Retrieved 21 April 2016. ↑ Wilson, Paul (23 April 2016). "Anthony Martial takes Manchester United past Everton to final at the last". The Observer. Retrieved 23 April 2016. ↑ "David de Gea wins Manchester United Player of the Year for record third time". Sky Sports. Sky Sports. 3 May 2016. Retrieved 18 May 2016. ↑ "BBC MOTD Save of the Season". BBC. Retrieved 18 May 2016. ↑ "Petr Cech wins Premier League Golden Glove award". Sky Sports. Sky Sports. 18 May 2016. Retrieved 18 May 2016. ↑ "Jose Mourinho began his reign as Manchester United manager with a trophy". 7 August 2016. ↑ Bandini, Paolo (25 May 2011). "The 'New van der Sar' fulfils his destiny". guardian.co.uk. London: Guardian News and Media. Retrieved 25 May 2011. ↑ "Valdés, De Gea, Azpilicueta, Javi Martínez y Pedro entran en la preselección de 30" [Valdés, De Gea, Azpilicueta, Javi Martinez and Pedro are short listed 30]. Marca (in Spanish). 10 May 2010. Retrieved 16 December 2014. ↑ "Euro 2012 trio Mata, Alba & Martinez in Spain Olympic squad". BBC Sport. British Broadcasting Corporation. 5 July 2012. Retrieved 8 July 2012. ↑ "El Salvador 0-2 Spain". BBC Sport. 3 June 2014. Retrieved 14 June 2014. ↑ "France beat Spain 1-0 in Paris courtesy of a Loic Remy goal". Sky Sports News. 4 September 2014. Retrieved 12 October 2014. ↑ "David De Gea should replace Iker Casillas as Spain's No. 1". ESPN. 10 October 2014. Retrieved 15 December 2014. ↑ Balague, Guillem (13 October 2014). "David De Gea has toppled Iker Casillas as No. 1". Sky Sports. Retrieved 15 December 2014. ↑ "Casillas tips De Gea for greatness". FourFourTwo. 2 June 2011. Retrieved 15 December 2014. ↑ "Euro 2016: Arsenal's Hector Bellerin in Spain squad after injury forces out Dani Carvajal". BBC Sport. 31 May 2016. Retrieved 1 June 2016. ↑ "Gerard Pique heads late winner as holders Spain edge past Czech Republic". BT Sport. 13 June 2016. Retrieved 13 June 2016. ↑ Taylor, Daniel (19 January 2012). "Manchester United's error-prone David de Gea may need eye surgery". The Guardian. London: Guardian News and Media. ↑ "United keeper De Gea facing eye surgery". ESPN. 20 January 2012. Retrieved 15 December 2014. ↑ Rice, Simon (16 March 2015). "David De Gea girlfriend Edurne Garcia appears to have come round to Manchester after all". The Independent. Retrieved 12 April 2015. ↑ "De Gea: David De Gea Quintana: 2008–09". BDFutbol. Retrieved 27 March 2014. ↑ "De Gea: David De Gea Quintana: 2009–10". BDFutbol. Retrieved 27 March 2014. ↑ "De Gea: David De Gea Quintana: 2010–11". BDFutbol. Retrieved 27 March 2014. ↑ "Games played by David de Gea in 2011/2012". Soccerbase. Centurycomm. Retrieved 10 September 2016. ↑ "Games played by David de Gea in 2012/2013". Soccerbase. Centurycomm. Retrieved 10 September 2016. ↑ "Games played by David de Gea in 2013/2014". Soccerbase. Centurycomm. Retrieved 10 September 2016. ↑ "Games played by David de Gea in 2014/2015". Soccerbase. Centurycomm. Retrieved 10 September 2016. ↑ "Games played by David de Gea in 2015/2016". Soccerbase. Centurycomm. Retrieved 10 September 2016. ↑ "Games played by David de Gea in 2016/2017". Soccerbase. Centurycomm. Retrieved 19 September 2016. ↑ "De Gea, David". National Football Teams. Retrieved 10 September 2016. 1 2 3 "David de Gea – UEFA.com". UEFA.com. 29 July 2013. Retrieved 21 June 2016. ↑ "Thiago leads all-star squad dominated by Spain". UEFA. Retrieved 21 June 2013. ↑ "Man Utd's David De Gea wins PFA Fans' Player of the Month for November". PFA Fans' Player of the Month. Retrieved 1 December 2014. ↑ Grant, Ryan; Thomas, Nathan (2 May 2016). "David de Gea wins third successive Player of the Year award". ManUtd.com. Manchester United. Retrieved 3 May 2016. ↑ Froggatt, Mark (19 May 2015). "David De Gea wins Players' Player of the Year prize". ManUtd.com. Manchester United. Retrieved 2 May 2016. ↑ "UEFA Europa League Squad of the Season". UEFA. 20 May 2016. Wikimedia Commons has media related to David de Gea.